The invaluable William Morris Archive , from the Univ. of Iowa, general editor Florence Boos. The archive provides several biographies of Morris, reliable text and notes, excellent commentary articles and other supplementary material for Morris's poetry and prose, including The Defence of Guenevere and Other Poems , The Life and Death of Jason , Earthly Paradise , his utopian novel News From Nowhere , and materials for exploring his work as a publisher in depth. "Biography of William Morris." A short biography of Morris, from the Victoria and Albert Museum. "William Morris and His Circle." A web exhibition from the Ransom Center at the Univ. of Texas includes manuscripts of William Morris, Edward Burne-Jones, and D.G. Rossetti, and examples from Morris's Kelmscott Press. "About William Morris." A brief biography of William Morris from the William Morris Society of the U.K.
Frye, Northrop. "The Meeting of Past and Future in William Morris." Studies in Romanticism 21, 3 (Fall, 1982), pp. 303-318 [jstor]. MacCarthy, Fiona. "William Morris: poet, prophet and upholsterer." An overview of Morris from his recent biographer. RSA Journal 143, 5457 (March 1995), pp. 61-74 [jstor]. Mackail, J. W. The Life of William Morris (1899). Full text of the excellent, early biography of Morris available at Google. "Garden of earthly delights." Article in the (U.K) Guardian by Fiona MacCarthy about a Morris house that has been acquired by the National Trust. "William Morris built his Red House in Bexleyheath, Kent, as a family home as well as a showcase for his ebullient decorations. It became an organic depiction of his philosophy of life, love and 'art for the people.'" "William Morris." An introduction to Morris, his biography, themes, imagery, and the cultural context, from the long-running Victorian Web, edited by Prof. George P. Landow. Pearson, Richard. "William Morris." A substantial introduction to William Morris from the Literary Encyclopedia [subscription service]. "Chaucer, The Works, Kelmscott Press, 1896." A youtube presentation from Peter Harrington Rare Books on the craftsmanship and artistry of Morris's Kelmscott edition of the works of Geoffrey Chaucer. Its illustrator, Edward Burne-Jones, referred to the edition as "a pocket cathedral." "William Morris and Wallpaper Design." Images provided by the Victoria and Albert Museum of Morris's early wallpaper, Trellis, Daisy, and Pomegranate, along with an explanatory essay on his design practice. "Rossetti's Obsession: Images of Jane Morris." Studio International 29 Aug. 2014. The William Morris Society in the U.S. 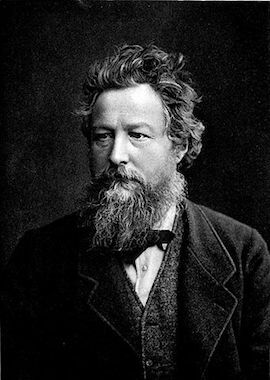 Web site offers some information about William Morris, including biographies and bibliographies. The William Morris Society in the U.K. A brief biography and an illustrated timeline. 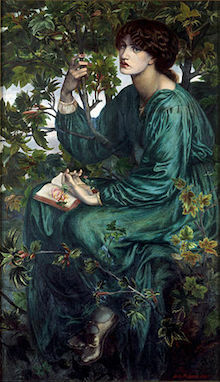 model for Dante Gabriel Rossetti's The Day Dream . Brantlinger, Patrick. "A Postindustrial Prelude to Postcolonialism: John Ruskin, William Morris, and Gandhism." Critical Inquiry 22, 3 (Spring, 1996), pp. 466-485 [jstor]. Hassett, Constance W. "The Style of Evasion: William Morris' The Defence of Guenevere, and Other Poems ." In Victorian Poetry 29, 2 (Summer, 1991), pp. 99-114 [jstor]. Holzman, Michael. "Anarchism and Utopia: William Morris's News from Nowhere ." ELH 51, 3 (Autumn, 1984), pp. 589-603 [jstor]. Kinna, Ruth. "William Morris: Art, Work, and Leisure." Journal of the History of Ideas 61, 3 (July, 2000), pp. 493-512 [jstor]. Lutchmansingh, Larry D. "William Morris' Review of Bellamy's Looking Backward ." Contrasting views of a perfect world. Utopian Studies 4 (1991), pp. 1-5 [jstor]. McGann, Jerome. "'A Thing to Mind': The Materialist Aesthetic of William Morris." 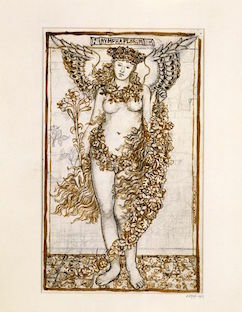 Huntington Library Quarterly 55, 1 (Winter, 1992), pp. 55-74 [jstor]. Pater, Walter. Review of The Earthly Paradise , by an important Victorian commentator. Westminster Review , Oct. 1868. Petts, Jeffrey. "Good Work and Aesthetic Education: William Morris, the Arts and Crafts Movement, and Beyond." The Journal of Aesthetic Education 42, 1 (Spring, 2008), pp. 30-45 [jstor]. Fliegal, Stephen. "Gothic Art for the Industrial Age: The Middle Ages Revisited in the Art of the Pre-Raphaelites." Lecture at the Cleveland Museum of Art, 10 Nov. 2002. "The Camelot Project," from the Univ. of Rochester, is a fine reference source for the medieval writing and art that inspired the Pre-Raphaelite painters and writers.